Your Local Driveway Cleaning Specialist. 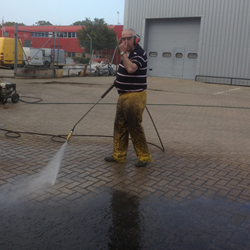 Captain Jetwash clean, repair and seal all types of driveways. After we have pressure cleaned the area we will make the necessary repairs so it has been revived to an outstanding refreshed condition. We communally repair driveways problems such as staining removal, sunken block paving, flaking concrete, broken slabs, faded/cracked tarmac and replacing missing mortar. Contact us now for a free no obligation driveway cleaning quote.